Form M-18 is a Hawaii Department of Taxation form also known as the "Combined Monthly Return Of Liquor Tax And Report Of Wine Gallons And Dollar Volume Of Taxable Sales Or Uses". 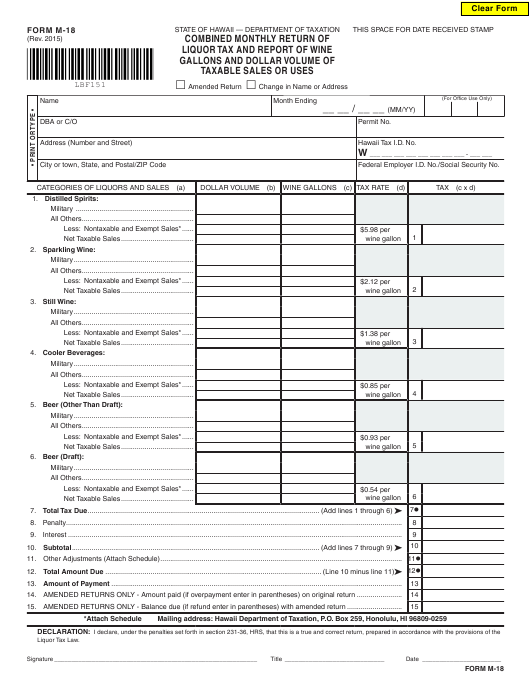 The latest edition of the form was released in January 1, 2015 and is available for digital filing. Download an up-to-date fillable Form M-18 in PDF-format down below or look it up on the Hawaii Department of Taxation Forms website. Federal Employer I.D. No./Social Security No. In computing dollar volume, exclude federal and state excise taxes. therefor, or any sale or use of alcohol, so purchased, for other than beverage purposes. Return must be completed in every detail. to support all entries on this return. Return must be signed by licensee or authorized agent. include beer, draft beer, cooler beverage, or wine. dioxide per 100 milliliters of wine, whether artificially or as a result of secondary fermentation of wine within the container. dioxide per 100 milliliters of wine. preservatives and which contain less than seven per cent of alcohol by volume. beer, and strong beer but does not include sake, known as Japanese rice wine, or cooler beverage. “Draft beer” means beer in an individual container of seven gallons or more.